Well light skin girls typically like dark skin guys so it is unusual. Do you guys think she likes that look in general or do you think she likes them because they look like Chris? Well I've seen some men pick similar looking women all the time. Like Prince seems to fall for the same type of look. Some people just get stuck on the same type of look. While most people would like their new year to start off drama and stress free, former Baldwin Hill star Seiko Huffman didn’t get that luxury. The model turned MaryFairy business chick surprised fans after revealing on twitter that she was JUMPED a few days ago. 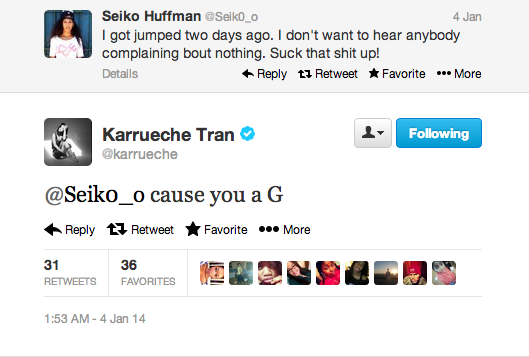 No word on who her attackers were or why this happened, but Seiko’s BFF, Karrueche Tran, had her back and called her a “G” for pushing through the drama. 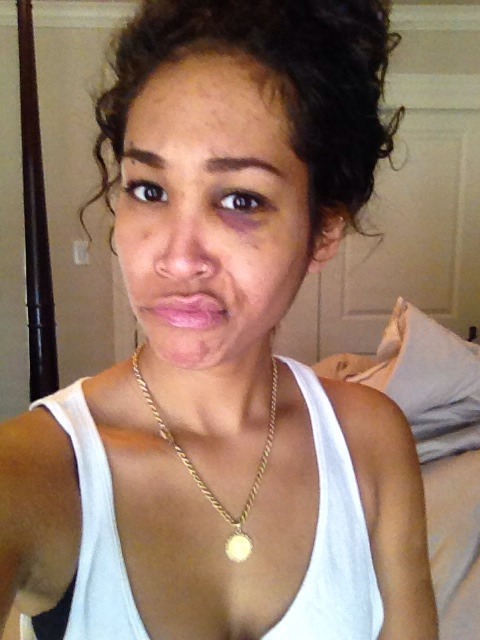 Seiko didn’t walk away from the fight unscathed though ….yesterday she posted a photo of her injuries, which include a mean black eye and a few scratches, and captioned it “There’s a first time for everything”. Here’s to a better 2014 Seiko! He does look like Chris brown, lol. She does have a type, do your exes and crushes tend to look alike? Last year, rapper Iggy Azalea taught us that the new way to bag a boyfriend on social media is to participate in #MCM [Man Crush Mondays] — and now Rihanna has joined in. a lot of people have a type. whats the big deal.